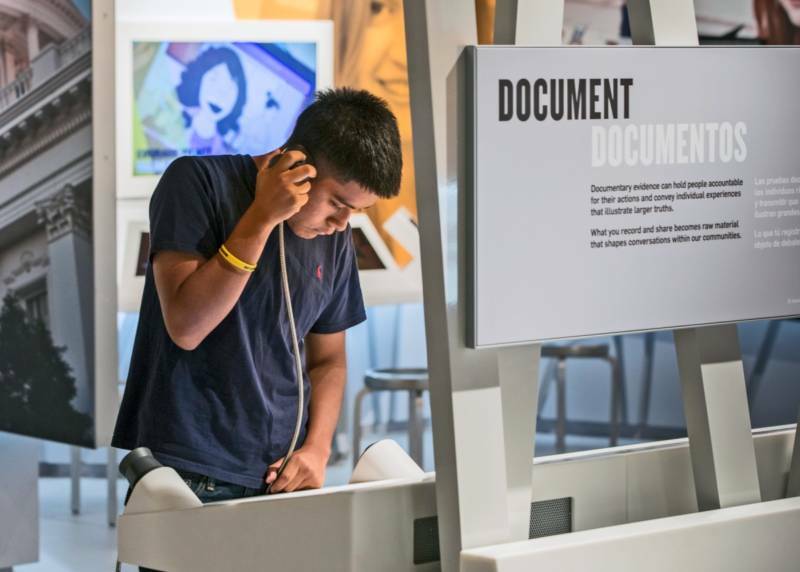 The “Facing Assumptions” game is one of the interactive experiences at the California Museum's new Unity Center in Sacramento, at the California Museum. In 1999, white supremacists firebombed three synagogues in Sacramento, and a women’s health clinic that performed abortions. In nearby Shasta County, a gay couple was murdered in their bed. It became known as the "Summer of Hate." The city was left reeling, but its leaders came together and decided to build a center where people from different backgrounds could meet and learn about civil rights history. It would also encourage people to teach each other about their differences, and search for common ground. Nearly two decades later, the Unity Center at the California Museum in Sacramento is finally ready. It opens its doors Saturday. Giant photographs hang on the museum walls, showing a rich diversity of faces, bodies, and styles: There are Californians in braids and headscarves, and other residents hugging, standing, smiling, or sitting in wheelchairs. The Unity Center uses interactive stations, videos, and games to create an immersive experience. One display surrounds the visitor with four large video screens of people talking. It’s like being dropped into the middle of a conversational circle, each speaker looking you directly in the eye. The first discussion to appear on the screen explores the experience of young Muslims. The other people in the video nod their heads in agreement. Sitting on the stool, it really feels like you’re in the room. Meeker said that effect is not an accident. In another conversation, adults with disabilities talk about being a parent. Vance has two daughters, and uses a wheelchair. In the video, he says that when he and his wife were expecting, they were met with confused reactions. “Once you announce to somebody that you’re having a baby, people I’d gone to church with, or hung out with...would ask, ‘Hey, how’d that happen? How’d you get pregnant?'" Cayla Sharp and Anne Cohen met each other for the very first time at a celebratory reception for the exhibit on Aug. 21. Both women are featured in Unity Center videos: Cayla appears in one that features transgender and gender-nonconforming youth. Anne's video is about parenting with a disability. She also writes a blog, Spastic Mama. The two excitedly shared their reactions to each others’ videos, and then the thrill of seeing the entire exhibit. “There was never a place for me to understand gender issues, and disability issues, from a younger age, because those types of things aren’t preserved in museums and history books,” Cayla said. “Just to see your community so represented in a museum outside of San Francisco, where it’s going to be seen by a broader community, in years to come, is exciting!” Anne said. 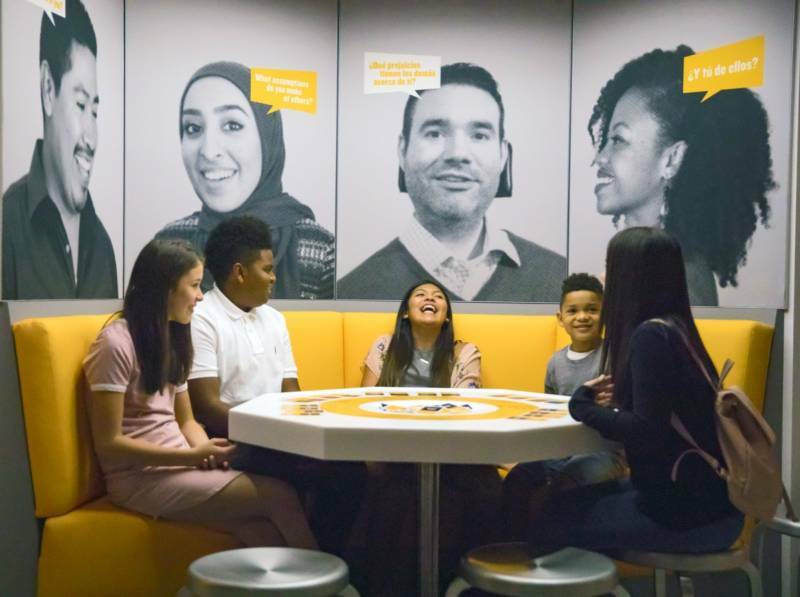 A different exhibit features a diner-style booth where you can sit down and play a card game with other museum visitors. The game is similar to a "stump your friends" game known as “two truths and a lie." Pinki Cockrell, who is white, sat down in the booth with two African-American women, Akilah Young and her mother Felicia Young. At a recording station, an 11-year-old named Zoe sat down on a stool and got ready to record her thoughts for the museum archives. As a robotic female voice counted down from three, she took a deep breath.